Former Reserve Bank of Australia board member Warwick McKibbin says the world’s central banks should switch to a system of using official interest rates to target nominal income growth to ensure huge household and government debt burdens are unwound safely. . . .
“Inflation has been a good intermediate step because it tied down price expectations and gave people confidence that central banks wouldn’t deflate away their assets,” he will tell a major economics conference in Sydney on Wednesday. “That’s important when you have high inflation,” as was the case in the 1970s, 1980s and early 1990s. “But you can still have the same credibility if you do have a very explicit income target, which is really growth plus inflation,” he says. In Australia, he suggests, that would mean the Reserve Bank would attempt to keep nominal gross domestic product growth – which is essentially a measure of how much the economy is paid for the goods and services it produces – at about 6 per cent. Australia has a population growth rate of 1.4%, and so there is no question that Australia’s NGDP growth rate should be higher than in the US rate (pop. growth = 0.7%), and much higher than in Japan (falling population). Nonetheless, I think 6% is a bit high, I’d recommend something closer to 5% for Australia. On the other hand even 6% would be far better than the sort of policy enacted by the Fed, ECB and BOJ since 2008. This supports the claim of various market monetarists, who have suggested that Australia was a covert NGDP level targeter during the Great recession. “What will matter over coming decades will be nominal income growth because the sustainability of high public and private debt-to-income ratios will need higher nominal income growth than in the past. Wait, that can’t be right. My critics say Australia was just a lucky country benefiting from a mining boom. It can’t possibly be doing well now that mining investment is collapsing. Or am I missing something? As the mining boom petered out, the Reserve Bank cut its benchmark “cash” rate from 4.75% in 2011 to 1.5%. The Australian dollar fell steeply (it is now worth $0.76, compared with a peak of $1.10 six years ago). The cheaper currency and lower interest rates have allowed the older and more populous states of New South Wales and Victoria to keep the economy bustling. Property developers are building more houses, farmers are exporting more food, and foreigners (both students and tourists) are paying more visits: Australia welcomed 1.2m Chinese last year, a record. Re-allocation doesn’t cause recessions, tight money does. In the past, I’ve argued that Australia might want to target total compensation of employees, rather than NGDP. That’s because changes in the price of mineral exports can cause big swings in NGDP, without having much impact on the labor market. Over the past 12 months, employee compensation in Australia rose by only 1.4%, far below the 7.7% rise in NGDP. You don’t see those sorts of discrepancies in the US. So maybe Australia doesn’t need tighter money. PS. David Beckworth has a new policy paper on NGDP and the knowledge problem facing policymakers. As usual, David includes some nice graphics. This entry was posted on July 18th, 2017 and is filed under Australia, NGDP targeting. You can follow any responses to this entry through the RSS 2.0 feed. You can leave a response or Trackback from your own site. « Wait, which tax are they repealing? “Re-allocation doesn’t cause recessions, tight money does.” What would Arnold Kling say? I say go for 6% annual growth NGDPLT. Even in the U.S. The fancy word is hysteresis. I think. Anyway, demand creates supply. (I always think of hysterical economists when I see “hysteresis”). Supply lines are global too. The world is glutted with productive capacity in steel, cars, smartphones, copper, aluminum, food, everything. Gypsum, clothing, TVs, you name it. It would be almost impossible for the US to create demand-pull inflation. Housing is short in some parts of the U.S. due to property zoning. Fix that, and we obtain higher living standards, less inflation and room for years and years expansion. The Fed should let it rip. The right-wing should become as vociferous about property zoning as they are about the minimum wage. Actually, a lot more. The American Credo: I believe in free-markets (as carefully defined and circumscribed by my class and interest group)! I wouldn’t hold Australia up as a shining example of economic management, rather we really are the “lucky country”. We benefited enormously from two resources booms (2000-2006, 2008-2014), both driven by China, the first from economic growth, the second by post GFC stimulus. And reinforcing both is an equally large immigration-driven population ponzi. The second mining boom in particular inflated our currency, to the point where our domestic manufacturing industry has been wiped out (Dutch disease). Where our central bank should have cut interest rates to lower the currency they were hamstrung by a over-inflated property market. While our public debt is comparatively small our private debt is the 2nd highest in the world, after Denmark. Um, Bill McKibben is an American environmentalist. Warwick McKibbin is an Australian economist. Different people. Otherwise, good article. BTW, Kevin Erdmann recently did a post that included a chart on Aussie and New Zealand house prices. Anyone who thinks foreign capital flows (born of trade deficits) do not affect house prices needs to ponder that chart. I think this is somewhat misguided, at least with respect to AU’s prosperity. Yes our GDP is pretty enviable, and indeed not wholly dependent on the mining boom. Yes the RBA was fairly quick to react and hasn’t pulled a Europe. But the main benefit has been population increases which have driven up Syd/Mel housing and both delivered capital gains (allowing debt to theoretically be retired) and housing construction booms in a few cities. And yet our GDP/capita is best described as ‘eh’; from 2003-16 we have ~16% rise vs 18% (GER); 11% (JPN); 13% (US) 15% (OECD average). Not bad, but not ‘once in a millennium mining boom’ either. And our population led growth has of course led to problems, not least of which is very high house prices and the associated mass of debt (compare AU @ ~120% GDP to US @ ~70%, JPN @ 60%, CAN @ 100%). This doesn’t invalidate anything the RBA has been doing, or even that it could have done better (note however that they are very much constrained – raising interest rates would lead to far higher repayment rates, well outside the poorly conducted stress testing done on our banks, and lowering rates further raises the question of how much these would pass through to consumers given that wholesale markets are a more important source of funds for AU banks). I would however suggest that the silliness of concentrating on GDP is not only because deflators are hard. NGDP has plenty of basic problems, and the RBA’s job is broader than making this 5% (as in they have encouraged the housing boom, despite the fact that this makes deleveraging harder – I know they don’t control population policy). So I think I read somehwere (The Economist, maybe?) that Poland also enjoyed an expansion that has lasted for 25 years now, at least they did not have a single year of negative GDP growth since 1992 (I don’t know about 2 consecutive quarters, which is the formal definition of a recession in the US, right?). Another “lucky” country then. No mining boom there, obviously. And they say China is in a bubble? “The National Association of Realtors released a report Tuesday that said foreign buyers and recent immigrants spent an estimated $153 billion on American properties in the year ending March 2017. That was a 49% increase over the previous year and the highest level since record-keeping began in 2009. Add on: In my pen for hire business, I am exposed frequently to foreign buyers of US real estate but who operate through a JV with a local partner, or through US-based entities. I do not know if these foreign cash flows through US-based entities are counted as foreign buyers, but I doubt it. Stuart, Actually your data proves it’s not luck, If it was luck then Australia would have had a recession when the resource boom ended. Instead they adopted a monetary policy that weakened the currency, cut real wages, and maintained employment levels. Brilliant! BP, Yes, thanks. What was I thinking? Alex, Monetary policy doesn’t affect trend growth in RGDP, so no surprise there. What it can do is smooth out the business cycle. Population growth can’t do that, but monetary policy can. Australia has problems with it’s regulatory scheme for housing, too many high risk mortgages and too little new construction due to zoning. I wouldn’t be surprised if the property sector got into trouble if and when immigration slows. There is also no guarantee that monetary policy will continue to be sound, as the new RBA head seems to lean a bit too much toward the BIS school of policymaking. Julius, Yes, although that’s less surprising in developing countries. The same is true of China, India and many others. Thanks for the post Scott. 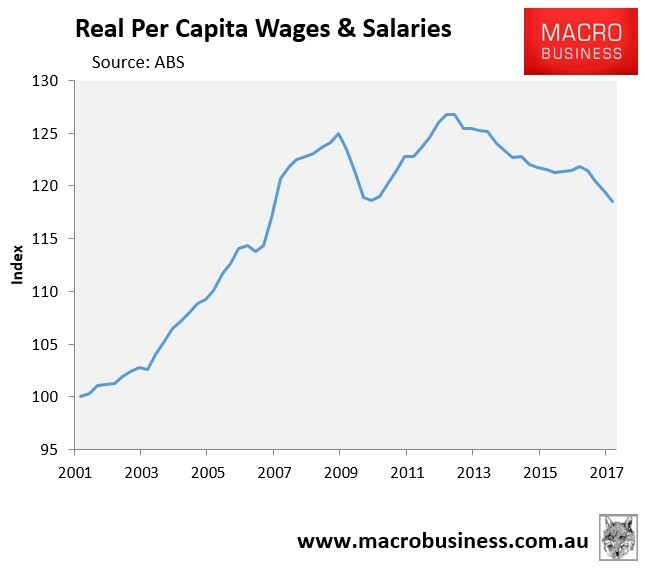 I think the RBA did very well in 2008-09 – they eased policy quickly and aggressively when needed and tightened again in late 2009 when the economy bounced back. But since 2011, I think they have been systematically too tight and not because they are targeting NGDP. In fact, until this year, NGDP had been growing at just 2-3% for quite some time and wage growth has been fallling. Accordingly, under NGDPLT, I think policy would remain loose now, despite the recent spurt due to higher commodity prices (which have partly retraced in recent months). It is frustrating to me that unemployment remains (5.5%) nearly as high as it got to in 2009, whereas it is below 5% in both the US and UK, which both experienced much more severe downturns in 2008-09. Rajat, I agree. 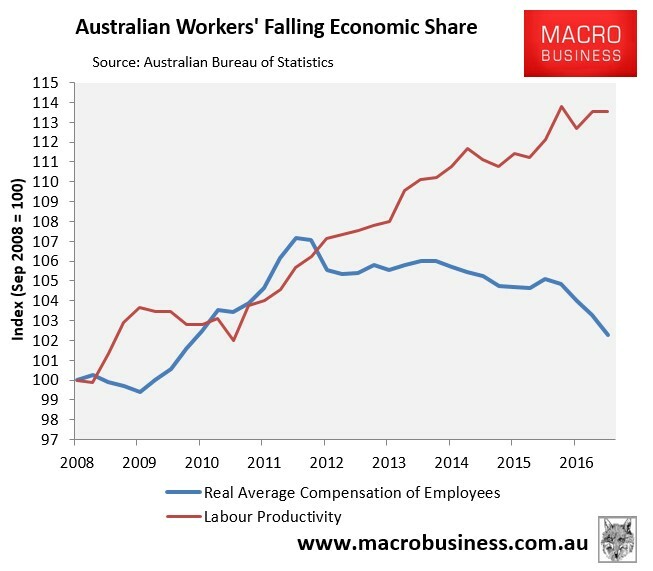 I’d add that total employee comp has only averaged 2.6% growth over the past 5 years–that’s too low. 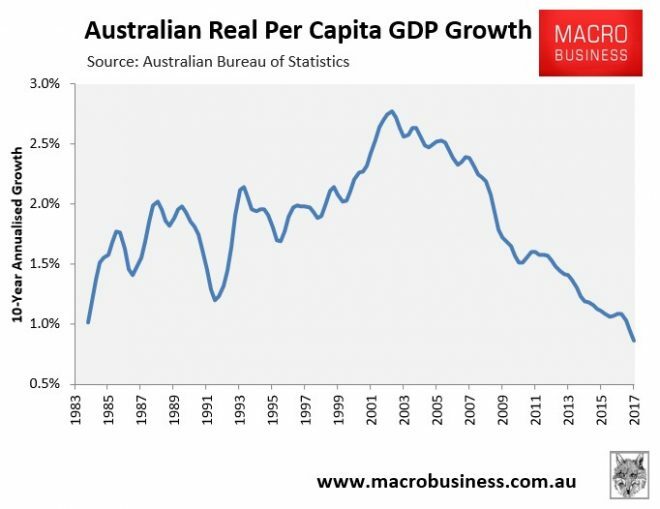 Over the past 26 years per capita GDP in Australia has been nothing special. Further, the standard deviation of unemployment is significantly HIGHER than in the US. So what exactly do you accomplish by avoiding recessions other than the elimination of scary headlines? Effem: less severe bouts of unemployment and economic dislocation. Which are good things. Also, NGDP targeting is a way of flattening the business cycle, it doesn’t solve supply side issues (which drive long term trends in per capita GDP). Thanks for clarifying Scott, that makes sense. I don’t see how you can draw that conclusion. It’s only in this last cycle that Australia’s unemployment had less volatility so n=1. Over the entire period that scott references Austalia’s unemployment has had a higher standard deviation than that of the US. If i want a country with low unemployment volatility I would point to Germany and they are clearly not doing anything even remotely resembling NGDP targeting. If you want to change an entire central bank mandate which has taken decades to become credible, you need much much better evidence than pointing at australia. Based on your preferred metrics I would conclude we adopt Germany’s monetary policy. I’m on board with NGDP level targeting. But this claim that it will help elevate public and private debt seems to be predicated on a bias towards higher inflation, right? I read this as “we can help debtors and screw creditors brought inflation… but it’ll be slow so it won’t bankrupt the creditors as bad”. Getting screwed in slow motion is still getting screwed. Seems to me like the only way to reduce REAL debt burdens is through real income growth. Nominal “help” is just default on your obligations by another name. Am I missing something. I would also note that Australia’s government spending as a share of GDP is much lower than in the bulk of the OECD, their government finances are in excellent shape with low public sector debts, their pension schemes rely on heavily incentivized private sectors savings rather than transfers and GINI-index measured income inequality is in line with the OECD average. All in all, Australia is doing a lot of things right. Effem, You don’t think smoothing out the business cycle would smooth out unemployment? Really? John, I want countries like Japan to stop redistributing money from debtors to creditors. NGDP targeting is neutral on that basis–check out the book “Less than Zero” by George Selgin.